Powerful yet tiny neodymium magnets are great for magnetic clasps in purses, apparel, printed folders or binders and more. While simple disc magnets are often a good solution, K&J Magnetics offers Sewing Magnets specifically made for this task. These magnets are also often called "Sew-In" magnets. Sewing Magnets are sold in matched pairs. Each magnet is marked with either a + or a - sign. 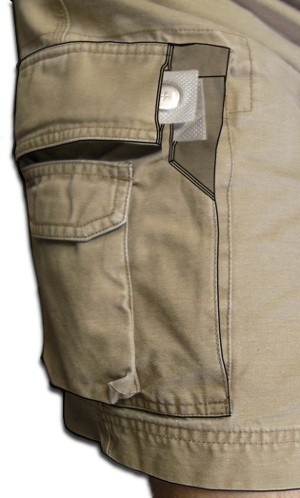 In the picture at right, they are used as the clasp for the pocket in a pair of cargo shorts. They are typically sewn into a hem or fold of fabric, so that the magnet is hidden in the finished article. There are many possible uses for such magnets, limited only by your imagination. They are very popular in purses, either as a magnetic clasp or to hold a decorative cover like the Miche bags. In our pocket example, the PLUS magnet is sewn into the flap of the pocket, while the MINUS magnet is sewn behind the pocket material. The PLUS and MINUS signs are facing away from one another, and the magnets face towards one another. The magnets pull towards each other through the two intervening layers of fabric. Scroll down to the end of this article to see a video of the pocket in action! We offer three sizes with very creative names: Small, Medium and Large. They are 1/2", 3/4" and 1" in diameter, respectively. Which size you pick depends on the desired strength, the available room, and the thickness of the layers of material that will be between the magnets. This material thickness is very important -- small differences in thickness can make a big difference in the strength! Here at K&J Magnetics, we don't have a minimum order requirement. We suggest trying multiple sizes to see what works best for you. Even if you don't end up using all of them on your current project, they're handy to keep in the back corner of the sewing box! With the plastic layer, or without? 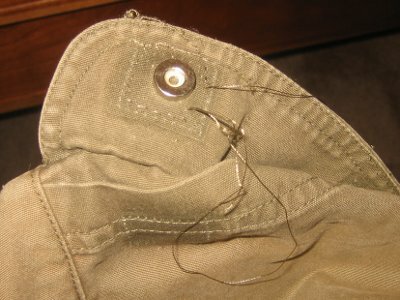 Sewing Magnets are constructed of a thin neodymium magnet surrounded by a thin steel cup. We offer them either with or with a protective plastic cover. The cover does protect the magnet from moisture and possible corrosion. If your item is going to be washed frequently, we recommend the plastic cover. If you're using it in something like a leather purse where it should never get wet, use the plain magnets. While the plain magnets are simply sewn into pockets of material, the plastic layer does offer something to sew thread through to hold the magnet in place. Sewing Magnets without the plastic cover will exhibit slightly stronger pull forces. Without the added thickness of the two layers of thin plastic between the magnets, the magnets are a bit closer together. The closer the magnets are to one another, the stronger the attractive force will be. Put a PLUS and a MINUS together, and they will attract towards one another. The integral steel cup helps to increase the pulling strength of the magnet, while also protecting it from damage. The steel cup around our Sewing Magnets also helps reduce the strength of any magnetic field outside the magnets. Will they erase my credit cards? Not in most cases. Neodymium magnets are used in purses, clasps and cellphone holders quite successfully without any issues. If you took one of these magnets and rubbed the magnet side across the black magnetic strip of your credit card several times, you could scramble the information on there. In normal use, however, you will have the magnets encased in a material of some thickness. That small distance can be enough to lower the magnetic field below the strength required to erase a typical credit card. Also, your cards aren't typically rubbing right up against the magnet, especially if the cards are inside a wallet. Note that there are two types of magnetic strips out there: high and low coercivity strips. The high strength ones are typically used on credit cards and ATM cards. Low coercivity strips are often found on hotel key-cards, some gift cards, and other temporary magnetic cards. The lower strength strips can be scrambled with these magnets. Care should be taken to keep such cards at least an inch or more away from these magnets. 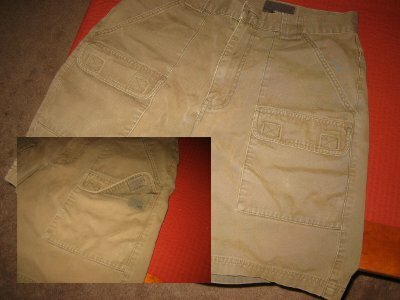 To see the product in use, we took an old pair of cargo shorts to experiment with. It had Velcro strips on the pockets that were fairly annoying to operate. They're noisy and you tend to yank up your own shorts when trying to open the pocket! We figured it was a perfect candidate for replacement with invisible magnetic clasps. First, we removed the Velcro pieces. 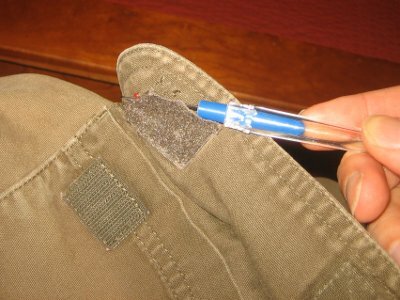 Next, we inserted magnets marked MINUS into the pocket flaps. 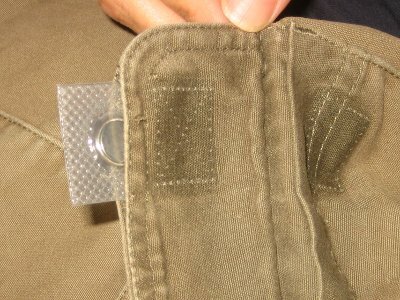 The magnet is sandwiched between two layers of fabric, and is not visible when slid into position. Thread is sewn around the magnet to secure it in place, piercing the plastic portion. Do not puncture the plastic protector too close to the magnet or it will no longer be waterproof. Another magnet can be used to hold it in place while sewing. You can use another sewing magnet of the same size, or a disc magnet with the same diameter. 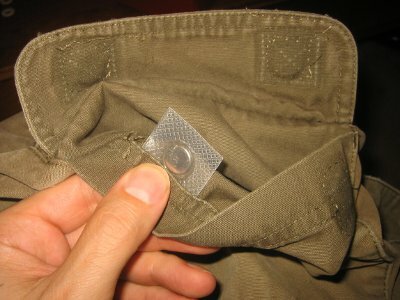 Insert the magnets marked PLUS under the hem, inside the pocket. It must be positioned to align properly with the magnet in the flap. The PLUS and MINUS symbols should be facing away from each other when the clasp closes. Finish sewing, and enjoy your magnetic clasp!